Epi-Otic is an ear cleaner for dogs and cats. 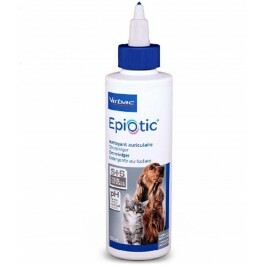 EPI-OTIC cleaner is a pH neutral, aqueous-based ear cleaner for dogs and cats. 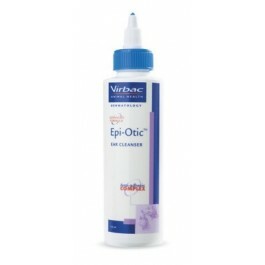 EPI-OTIC is for use in healthy ears for routine maintenance cleaning or for ears affected by otitis externa. The synergistic action of the active ingredients reinforces its cleaning activity. Salicylic acid and lactic acid in free and encapsulated forms. Contains PCMX, sodium docusate and chitosanide. 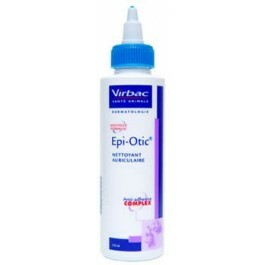 Place the tip of the applicator in the ear canal, and squeeze the bottle gently to release a small amount of Epi-Otic. Gently massage the base of the ear, then wipe the inside of the ear flap with clean cotton wool.